Written by Scott Joseph on 03 December 2009 on 03 December 2009 . I had one initial reaction when I visited the new location of Paris Bistro, the little Frencherie that moved recently from its Aloma Avenue locale. Of course, part of that is because I was familiar with the old place. The decor and overall ambience of the bistro’s Aloma location was, how you say?, crummy. It was always neat and clean, to be sure, but it was small, cramped, and a barebones renovation of what started out as office space. Indeed, the restaurant’s neighbors there included a urologist with a rather large sign announcing that specialty. Charmed, I’m sure. So even when I announced in August that current owner Tatiana Cerruto would be moving to Park Avenue, I knew it would be an improvement. But I had no idea it would be this nice. 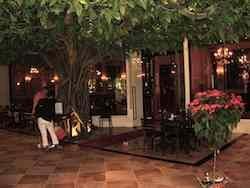 It begins with the entrance to the hidden garden where Paris Bistro now resides. There are a few of these area set back from the avenue, little outdoor alleyways to shops where the walkway is bricked. The area that PB is in, called Shops on the Park, has been redone to include a roof overhead and classy travertine tile under foot. The front walls of Paris Bistro are floor to ceiling windows, so diners inside can enjoy the ambience of the “outside.” But the inside is pretty nice, too. The decor is the very epitome of a typical bistro in the City of Lights, right down to the red velvet banquets and gilt-framed mirrors (tiles instead of one-piece glass). Tabletops are dark granite, and the flooring, a continuance of the travertine, has elegant black granite diamond “dots.” The ceiling is coffered wood, and throughout are the dulcet tones of Edith Piaf on the sound system. Of course few of Paris Bistro’s regulars went for the atmosphere, obviously. Its true hallmark was the simple yet exquisitely prepared traditional French dishes, and, not incidentally, the reasonably low prices. With all the new fineries -- and a Park Avenue address (read: higher rent) -- there would have to be compromises, no? No. Well, prices might be slightly higher, but most items on the dinner menu are still well under the $20 mark. And lunch is still a veritable bargain, with a prix fixe option of three courses for $11.95, plus the purchase of a beverage. I went the bargain route when I lunched there recently. I selected the Bistro salad as my first course followed by the beef Burgundy. The salad was a lovely plate of mixed lettuces, sliced tomatoes, red onions and carrots dressed with an herby vinaigrette. A nice salad. The other option for the starter course was a Caesar salad, which I see as no option at all. Both my companion and I said it would be nice to have soup as an option, especially this time of year as the temperature dips into the low 80s. I asked our waiter if a soup substitution wasn’t possible -- restaurants just love it when guests try to substitute on a prix fixe menu! -- and to his credit he said he would be happy to do it. When he returned a few minutes later to say the soup of the day was not yet ready, I suggested my friend simply order the onion soup and we’d pay the extra fee. In the end, a cup of onion soup was brought as part of the prix fixe. How nice. My beef Burgundy was delightful, a sizable dish of bite-sized meat braised in red wine. My companion chose the quiche Lorraine, the quiche du jour, a classic egg pie with bacon and Swiss cheese. It was a high wedge that was distinguished by the way it jiggled, as if it were made of gelatin. But apparently that was just a side effect of its well-whipped frothiness. It was deliciously light. For dessert there was an excellent creme brulee, a perfect custard with a rich vanilla flavor and a crisp, if not quite burned, crust. My guest had the profiteroles, little frozen pastries filled with ice cream and drizzled with chocolate sauce. I preferred the creme brulee. Service was superb and accommodating, if you hadn’t already gathered that from the substitution mentioned above. I was amused at how many servers were on hand. It’s a far cry from the early days of Paris Bistro -- when it was punctuated Paris-Bistro -- and the original owners, (then) husband and wife Jean-Marie and Roselyne Marlot, comprised nearly the entire staff, she cooking and he waiting the tables. That, too, was part of the charm. I know a lot of people greeted the news of Paris Bistro’s move with trepidation. But trust me, Paris Bistro is better than ever, and in just about every way. Nothing has been lost in the transfer, you’re merely trading quaint for style. Paris Bistro is at 216 Park Ave. N., Winter Park. It is open for lunch and dinner daily. The phone number is 407-671-4424. Click here for the Web site.